So your house isn't filled with decorative candles and throw pillows. 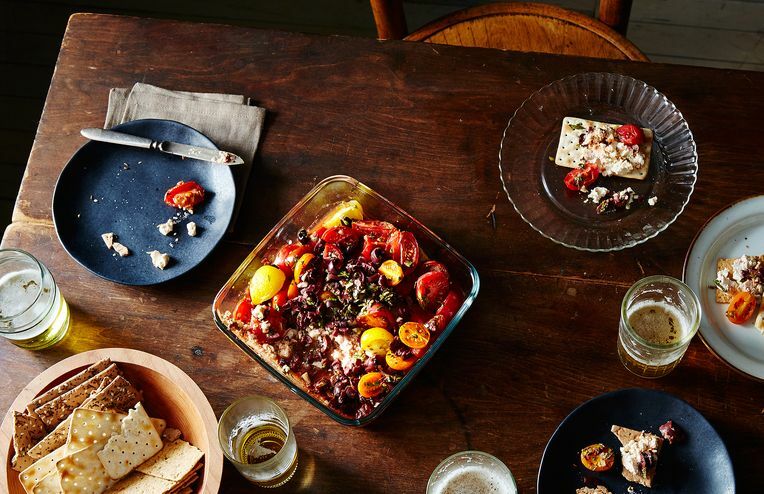 With a recipe for 15-minute baked feta, you can be a great host regardless. A flavorfully complex orecchiette—with nettles, sheep's milk feta, and chive blossoms—for eating outdoors with friends (and wine). The editorial team learns the key to a great salad: More cheese and more nuts. A simple, salty-sweet lunch -- or breakfast, or dinner -- you'll want to pile high on toast. Master the art of the sauté -- starting with shrimp. Cauliflower becomes centerpiece, and a stunning vegetarian main is born. Crumbly, tangy feta cheese can be made in the comfort of your kitchen. Mary Karlin, author of Mastering Fermentation, shows us how. Your new dinner party hors d'oeuvre. As our hearts pine for summer, Jenny gives us sliders. Today's lunch is barley with Mint-Pistachio Pesto (a Your Best Recipe with Mint finalist!) and crumbled feta. In Amanda's words: "Kids love mix-ins! And watermelon. Because it's summer, and kids deserve to eat lots of watermelon when it's in season."